W. Covina Quick Service Restaurant w/Low Rent & Great Location! This West Covina quick service restaurant with seating for 12 currently operates with a well branded Mexican concept that has been in the area since 2004, and from its current location since 2010. The restarurant boast low rent, fantastic street visibility, great freeway access, onsite parking, as well as room for onsite events! Location and Facilities: This 1,000 facility leases for $1,250 per month on a lease with 3 years remaining. All of the business's furniture, fixtures, equipment and goodwill will be included in the sale (the name and website may be shared with the owner's other operation). Kitchen equipment includes a six burner stove and oven, a grill, deep fryer, refridgerated salad prep table, heated sauce table, a 2 and 3 bucket sink and additional refridgerators and a freezer (no walk-in), as well as a manager's office. Market Information and Position: New owners may seek to use this excellent location and facility to modify the concept from its current Mexican quick service one, or they may seek to run with the same concept, promote the business and focus on the catering and other markets for additional growth. The location boasts excellent street visibility, freeway access, a large parking lot as well as an area for onsite events, coupled with a great lease rate, thus providing it an advantage over most competitors. Shall a buyer retain the name, the business will receive free additional marketing and promotion from a complementary yet non-competing operation with similar branding. 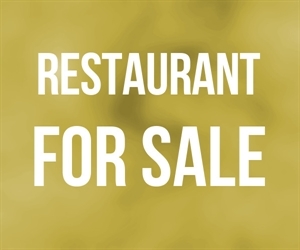 Competition: This restaurant does have a few nearby quick service and full-service food venues, however, it has managed to carve out an immediate market niche while developing a loyal customer following. As such, there is a reduced threat of new direct competition.